The DeVore-Snyder Funeral Home at 75 W. William St., Delaware, will be demolished to make room for a new Fahey Bank location, pending approval by Delaware City Council. With three locations already existing in Marion, and a loan office located in Columbus, Fahey Bank is looking to continue to grow its business in Central Ohio. On Wednesday, the Delaware Planning Commission approved a combined preliminary and final development plan for a new branch to be constructed at 75 W. William St.
DeVore-Snyder Funeral Home currently sits on the property, but the structure will be demolished to make way for the new bank branch. Fahey Bank’s proposal shows a two-story, 5,300-square-foot building that would be constructed out of a mixture of brick and limestone. Access to the bank will include two drives along Washington Street and one on William Street. The branch will feature three drive-thru bays and include 31 parking spaces. The duration of construction is expected to take anywhere from seven to 10 months. 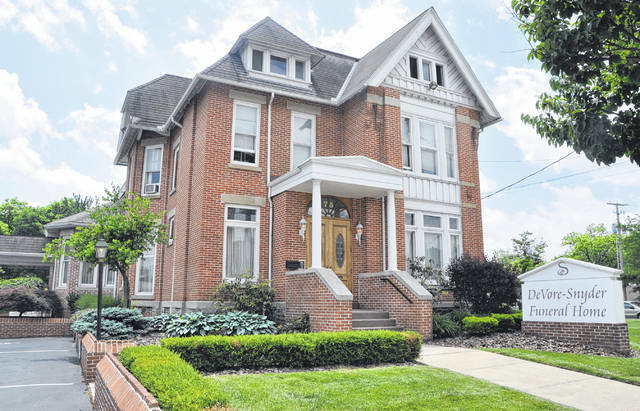 Coleman Clougherty, the bank’s executive vice president and chief operating officer, said the bank already has a number of customers in the area, and with a loan office located in Worthington, Delaware is a natural connection for the 153-year-old company. Asked how many workers the branch will employ, Clougherty said there will be eight or nine employees onsite. However, he said with the Delaware location being between the locations in Worthington and Marion, this branch will include a “disaster relief site” and training facility, which could mean as many as 40 employees in the building at any time. Clougherty also said that the parking spots would be available for public use after hours for events downtown, such as parades and First Friday celebrations. “We want to be a part of the community, and we see that as a significant part of it,” he said. Clay Snyder, the former property owner for the past 25 years and overseer of operations for the funeral home, was on hand to give his endorsement for the bank and welcome them to the community. “Their organization is similar to our own, family-centered, multi-generational, with a long, strong history,” Snyder said of Fahey. Snyder, who once lived in Marion and is familiar with the company, said they have always been “community stewards, supportive of Marion’s activities” and went on to say he was confident they would be the same here in Delaware. The combined preliminary and final development plan will now go before Delaware City Council for final approval. Council’s next meeting is scheduled for Monday, Dec. 10, at 7 p.m.